The Netherlands has a thriving economy and is a major gateway to Europe. It is culturally similar to the UK, making it an ideal test market for products. In the 4 quarters to the end of 2018, it made up 6.8% of UK exports. The Netherlands has excellent access to the European mainland and many goods enter the EU through it. Its transport infrastructure was ranked as one of the world’s best by the World Economic Forum in 2018. Dutch consumers are open to new products and experiences and often look to the English-speaking world for new trends. The Dutch love the English language and have a taste for British goods. The Netherlands has the fifth largest economy in Europe, with the 12th largest per capita GDP in the world. It is one of the world’s most open economies, and 2019 growth is predicted to be 1.8%. Export opportunities include defence and security, food and drink, offshore wind energy and technology. There are many opportunities for UK companies in the Netherlands' defence and security sector. After years of budget cuts the Dutch government will be modestly investing in defence. Projects include the replacement programmes for submarines and frigates. Amsterdam is a major centre of international commerce and the port of Rotterdam is home to Europe’s most important logistics hub. There is currently a demand for cyber security services. There are opportunities in food retail and services, including plant-based meals, dairy alternatives, spirits, organic food, private label products and healthy snacks. The Netherlands’ affluent, UK-friendly population has a taste for traditional British tea room products, whisky, gin and cheese. Younger generations are embracing trends from the London ‘foodie’ scene. The UK’s ethnic cuisines are also becoming more popular. The leading Dutch supermarkets are always looking for new suppliers for their own-brand products, both traditional products (including tea, baked goods, snacks and cereals) and new healthy options (including ‘free from’ and low-sugar ranges). The government is promoting healthier lifestyles to fight the growing problem of obesity and diabetes in the country. There is also a national campaign to introduce more plant-based eating to everyday diets. The Netherlands plans to build 5 new wind farms by 2023. These should create a total installed capacity of 4.5 gigawatts. There will be opportunities for UK companies throughout the project lifecycle. Developers will need support during and after the bidding process for the offshore wind power site, and following the award of the contract. There are opportunities for UK businesses in forming strategic alliances with Dutch companies to offer project and delivery expertise. Limited domestic experience in operations and maintenance may create opportunities for experienced UK companies to offer their services. 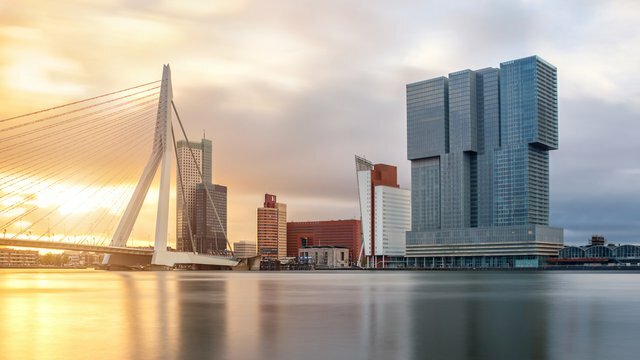 The Netherlands’ growing technology sector offers a range of opportunities for UK companies, including in logistics, sustainable cities and renewable energy. The Netherlands has a dense network of road, rail, water and flight connections, so there is strong demand for innovative technology for the logistics industry. The road network needs innovations to help monitor and manage the flow of traffic. There is a strong trend towards urbanisation in the Netherlands. Amsterdam, Rotterdam, The Hague and Utrecht are growing rapidly. There are opportunities to offer sustainable solutions to water management, energy usage and 'liveability' challenges in these cities. The Netherlands is moving away from the use of gas and towards renewable energy. The large-scale industrial, agriculture and logistics sectors, as well as consumers, will need support with this change. The Netherlands has a large banking sector and Amsterdam is at the heart of the financial industry. The importance of the logistics sector is creating opportunities to provide financial, legal and advisory services. Banks, insurance companies, legal firms and consultancies with good knowledge of international markets will find significant opportunities. An attractive economic environment for international businesses, the Netherlands is home to many international companies’ headquarters. These headquarters need English speakers who can provide high quality financial and professional services. The Dutch financial sector is moving towards a cashless economy and banks are rapidly introducing mobile banking. Exporters that can offer innovative, safe and secure solutions for mobile banking and investment will find strong interest from Dutch companies. It is a good idea to make yourself aware of sales tax rates, rules around product standards and labelling, and local expectations about payment times. The UK and the Netherlands have signed a double taxation agreement, meaning the same income is not taxed twice. VAT is called BTW in the Netherlands. The usual rate is 21%. A lower rate of 9% applies to some products and services, such as food, medicines, and paint and plaster for homes. Products and services should meet relevant EU safety standards, including clear instructions for proper use, and include warnings against misuse. EU standards apply to packaging. The National Institute for Public Health and the Environment (RIVM) is responsible for standards. Dutch law requires that every invoice should be paid within 30 days, unless the buyer and supplier agree on other payment conditions. A payment term of over 60 days is only allowed if it can be shown that it is not detrimental to either party. The Netherlands Enterprise Agency has provided more information on payment terms. The Netherlands is a small and well developed market, so a local representative can be very helpful.